One thing that has fascinated me about the Thomson area is the birth of Bishan from its former namesake the Pek San Teng cemetery. The 121-hectare of cemetery land spread over several hills, each decorated with the famous tengs (pavilions), made way for the New Town in early 1980s. It must have been the biggest public housing project on cemetery land in recent times; and also a wildly successful one, for asset prices were not kept down despite its pantang history, no wonder millionaires here are on the rise. As I did not have the chance to visit the cemetery or witness its transformation into the housing estate, I often wonder about the exact boundary of Pek San Teng vis-à-vis Bishan and whether it is still possible to find vestiges from the bygone era. Now, where shall I begin? With the Kallang River forming a natural boundary to the north and east, road vehicles would have to access Pek San Teng via Upper Thomson to the west or Braddell Road to the south. Old reports inform us during Cheng Beng, due to the road congestion, drivers had to strictly adhere to entering the cemetery from Upper Thomson and exiting it at Braddell. 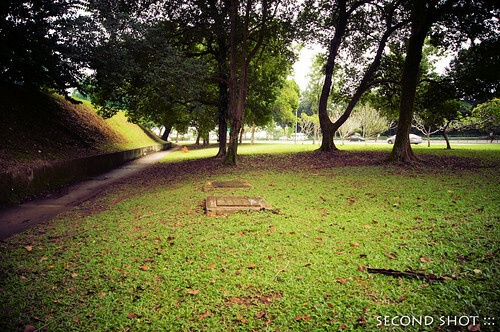 The entrance of the cemetery was around the 4 3/4 milestone Upper Thomson; a road would lead the vehicle past a kampong (which has the same name as the road - Kampong San Teng), to the Kwong Wai Siew temple, and beyond that the cemetery. The exact spot of this road junction would be 300m from the start of Upper Thomson Road. I have no photos to show of this junction, though I have seen photo of a dirt track that leads to the kampong (could be the same road but metalled later). The entrance of Kampong San Teng and Jalan Pemimpin from Upper Thomson Road. Both stretches are expunged today. From a scan of the 1981 street directory by Chun See where he blogged about his blind date. I blogged about the Westlake detached houses (which according to Peter were available, by today's standard, at dirt cheap prices in the 1960s) and the granite wall that are still visible today. 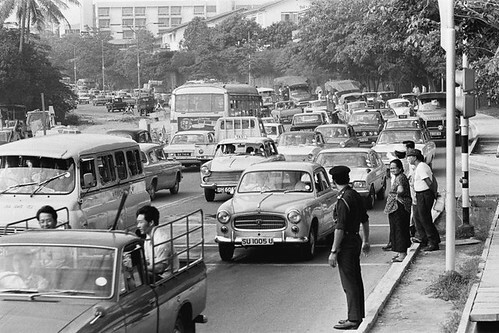 According to old photos and maps, Upper Thomson Road used to follow the perimeter of this wall to a bend where the road then curved to the right. I believe we can still see vestiges of the old alignment today, as you continue walking past the granite wall, at the grass patch outside the relatively new semi-detached houses. Here at house #21 (the one with a dirty wall), you can see what is possibly a vestige of the old alignment - the bend of Upper Thomson Road to the right. Today, a narrow, straight road leads into St. Theresa's Home. Oddly enough, this road is named Upper Thomson though it is not the original alignment and the road into the private estate Westlake Ave separates it from the main Upper Thomson; in other words the two Upper Thomson roads are disjointed. My guess is that since this narrow road serves only the Home, to reduce confusion they retained the name of the old road, with the result the address of the Home - 49 Upper Thomson Road - remains unchanged. Kampong San Teng joined Upper Thomson after the entrance of Little Sisters of the Poor (now renamed St Theresa's Home). 100m ahead, Jalan Pemimpin met up with Upper Thomson. Both intersections are expunged today, with Jalan Pemimpin truncated at Bishan St 21. 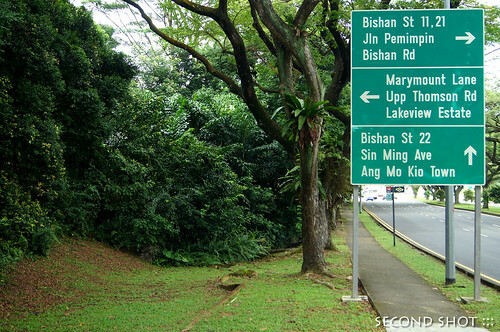 Curiously there is a green corridor between Upper Thomson and Marymount Road, where we would find the two disappeared roads, that is quite overgrown with vegetation. Nowadays when I have to take a bus on Upper Thomson from Marymount Station, I choose the bus stop opposite St Theresa's. I like the vegetation which acts as a buffer. Upper Thomson here feels like a world of its own. Indeed if you walk from Bishan Fire Station to the bus stop, you find Marymount Road becoming increasingly hidden due to the vegetation, though the two roads actually converge. "Thick vegetation" between Marymount and Upper Thomson Road. In the foreground, there is what looks like a kerb on the grass which I cannot explain. After comparing aerial photos, maps and my ground surveys, I believe the road junction with Kampong San Teng to be at the position just after St. Theresa's entrance. A question can be asked - how did vehicles from the main road access the Home then, given the road skirted its perimeter. To be honest, I'm not sure, just as I cannot explain the presence of the old banyan tree outside the entrance. Could access be that small lane just before the traffic light in the old Cheng Beng photo? A green corridor after St Theresa's entrance reminds us of the old Upper Thomson's alignment before it joined back with the new alignment today. I believe this to be the position Kampong San Teng joined up with Upper Thomson. Today an underpass outside St. Theresa's marks the road to the cemetery. This underpass would not have existed before Upper Thomson was realigned, which was probably in the mid 80s after Bishan was developed. As you walk down these old stairs to enter the underpass, guess what would you see at the end of the tunnel? Back to the question whether we can still find vestiges of the entrance to Peck San Teng, I found out the answer is 'yes', but that would have to be 2001. You see, as recent as 10 years ago - about 15 years after Bishan New Town was developed - part of the road 'Kampong San Teng' was still visible from aerial photographs. By 1990 when Raffles Institution shifted to their current site, 'Kampong San Teng' further inside would have been destroyed. 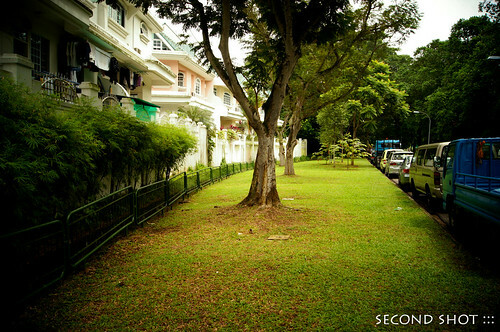 Since RJC only shifted to the current site end 2004, it is very possible that the part of 'Kampong San Teng' close to Marymount Road was left untouched till the construction of the campus. The same view in almost three decades. 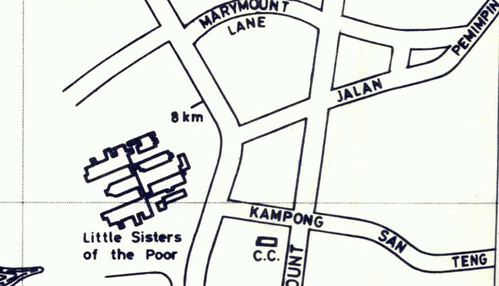 St. Theresa's is at its original position while Marymount Lane and Marymount Road were already present by 1981. The remains of 'Kampong San Teng' would have been at the edge of the RJC stadium today. As you travel down Marymount Road, look out for this gate outside RJC (I don't think this is a real gate), which would be Peck San Teng entrance from Marymount Road. Once you drive into Kg San Teng Road from Thomson Road (just after the Little Sisters of the Poor), you will drive downhill until you come to a junction. After that it's hazy in my memopry (maybe there was a kampung there also before the temple). I do know there was a Chinese temple and a small pond (for those intended to burn paper boats to send to the deceased). Inside the temple there were many tablets of the deceased. During Cheng Ming, the grass cutters will wait outside the temple. After prayers there, they will ride on your car bumpers with a sickle in one hand. I think it's a sort of intimidation that "you better hire me to cut grass". This is the part I'm confused. Today Marymount Road is a dip between RJC and St. Theresa's. I wonder how could 'Kampong San Teng' have dipped then suddenly went up again. I dont really know about today's terrain since I hardly go there these days but I do remember in the 1960s when we went there for Cheng Ming, the road dips down and up slightly again. Could the place be land-filled in the 1980s? Icemoon, Peter. As you know, I have blogged about the times that I used to go for annual Qing Ming exercise at Pek San Teng (here). Unfortunately, I don’t recall the exact route that we took to enter this area; or what the terrain was like. As for the exit to Braddell Road, that is easy; becos it is down a short road that ran parallel to the zinc sheet walls of our beloved South Country Theatre (SCT). What I do remember is that as you entered Kg San Teng (KST) from Upp Thomson, you will come to a Y-junction where the huge temple was. To access the cemeteries, you enter through the road on the left (you can find many photos of this view in Picas). You exit from the cemeteries using the road on the right. This road passed by the entrance of SCT. As you come out using this road, you can also turn left into Braddell Rd using the SCT exit I mentioned above. 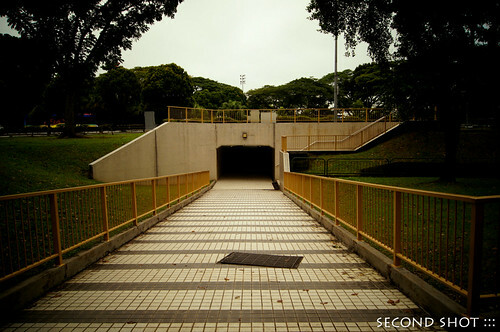 Besides these two entrances/exits, there was another way to enter KST cemeteries which was via a dirt track in Braddell Road near to Kallang River. I have posted a map here. Today, it should be Bishan St 11. There was one year when we did not drive but cycled instead. We used this entrance. I think my father wanted to avoid the traffic jams. Sorry, I forgot to mention. The exit to Braddell Rd at the side of South Country Theatre is not a proper road but a dirt track. They allowed this track to be used during Qing Ming so that we can bypass the traffic jams at Upp Thomson. All the graves were on the hill slope and the one-lane metalled road (with potholes) inside the cemetery grounds was lower than the graves. Tempers always fly when someone park on the grass verge and block vehicles passing thru or some drivers forgot one-way direciton and two vehicles meet head-on. Though we were Catholics, that did not stop me from helping to cut the grass. My garnd-mother who was a Taosit never insisted that being of different faith we would have to eat the offerings or to offer wax red/incense joss sticks. To her filialpiety by doing some work like grass-cutting was good enough. As usual I was always curious why some graves hadd deep trenches but no tombstones nor coffin inside. Nice to get to know about past histories. Good Work! Thanks KingS for the encouragement, hope to see you around! I think I should research more on Pek San Teng, based on Chun See and Peter's comments.